Exhaust camshaft alignment tool – BMW No.11 9 291/3. Inlet camshaft alignment tool – BMW No.11 9 292. Inlet camshaft turning tool – BMW No.11 9 270. Flywheel/drive plate timing pin – BMW No.11 5 120. Sensor gear alignment tool – BMW No.11 9 350. Timing chain pre-tensioning tool – BMW No.11 9 340. NOTE: Refer to Autodata Technical Data for tightening torques. NOTE: Refer to Technical Data module for tightening torques. Ensure rear of camshafts correctly aligned  . NOTE: Curved profile at rear of camshaft points upwards  . Install inlet camshaft turning tool at rear of camshaft. Attempt to turn inlet camshaft slowly in opposite direction of rotation. If camshaft turns, continue turning until locked in position. Attempt to turn exhaust camshaft slowly in direction of rotation. NOTE: In the installation position camshafts cannot turn freely. Timing correct when inlet camshaft alignment tool abuts cylinder head or is raised up to a maximum of 0,5 mm on inlet side. Timing correct when exhaust camshaft alignment tool abuts cylinder head or is raised up to a maximum of 1 mm on inlet side. Slacken bolt on each camshaft adjuster and then re-tighten by hand  . Align inlet camshaft. Ensure inlet camshaft alignment tool abuts cylinder head. Tighten exhaust camshaft alignment tool to cylinder head. Tighten bolt on exhaust camshaft alignment tool until it rests on inlet camshaft alignment tool  . Tighten inlet camshaft alignment tool to cylinder head  .NOTE: Tensioner plunger is spring loaded. 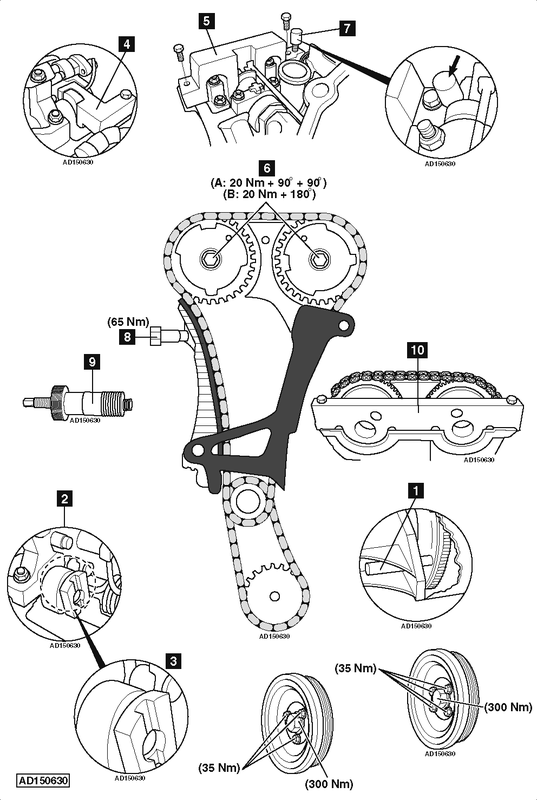 Remove tensioner  .NOTE: If chain tensioner is to be reused it must be drained of oil. Compress plunger slowly twice. Screw in adjusting screw until in contact with tensioner rail. Replace bolt on each camshaft adjuster and re-tighten by hand  . Slacken bolt of each camshaft adjuster by half a turn  . Pre-load timing chain with tensioning tool to 0,6 Nm  .NOTE: Bolt for camshaft adjusters MUST only be used once. Tighten bolt of each camshaft adjuster  . First stage – 20 Nm. Remove flywheel/drive plate timing pin  . Remove sensor gear alignment tool  . Install tensioner assembly  . Tightening torque: 65 Nm. Timing correct when camshaft alignment tools abut cylinder head  &  .